Think "Kraken" and the image of a murderous sea monster with tentacles a plenty comes to mind, but starting today Razer hopes consumers think of something significantly smaller though no less killer. The company behind the Electra and Tiamat 7.1 headsets is out with a new top-end pair, the Kraken Forged Edition headphones. With earcups cut from aircraft-grade aluminum, the Razer Kraken Forged Edition promises the rumbliest basses, crispest highs and most melodic middle tones as it channels sound for games and music. The isolated closed earcups work together with the headphones acoustic chambers, Razer explained in a press release, to create a rich delivery system straight to the ear. Priced at $299.99/€299.99, or about £185/AU$372, the pair is available now through Razerzone.com. A worldwide release is slated for December. The price is certainly on the higher end, but consumers are getting a sharp looking (and sounding) set for their money. 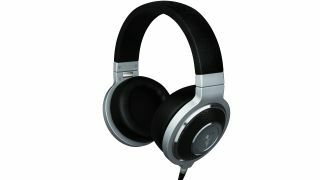 The headphones weigh approximately 390 grams, supporting a frequency response of 20 - 20,000 Hz. Input power is marked at 30mW, and the set includes custom-tuned 40mm neodymium magnet drivers. Those who order the Kraken will also receive a swappable cable with an in-line microphone, so they can switch from singing alone to a song to talking smack on Battlefield 4. The mic's frequency response lands between 50 and 10,000 Hz, and its signal-to-noise ration is 60 dB. Specs aside, there's a promise of comfort, too. The ear cushions are lined with a plush leatherette material, and the headband is full adjustable. This handcrafted headphone is designed for hours of use, not to drive you to the point of tearing it off in a discomforted rage. The Kraken also includes a 1/4-inch audio connection to plug into like-sized or 3.5mm audio jacks. Razer said that for audio + microphone usage, devices need a 3.5mm audio + mic combined jack. The Kraken is compatible with iPhones, HTC and BlackBerry handsets. As long as a smartphone or laptop has a default 4-pin TRRS audio + mic combined jack, those devices should work with the Kraken. You a gamer? You read our PS4 review? Well, you should.